Danny Boyle’s 28 Days Later was a great take on the zombie genre which saw the UK laid to waste by a man made rage virus which turns those infected into violent, bloodthirsty maniacs. This sequel picks up 28 weeks after the epidemic outbreak, with the situation contained and citizens slowly reintegrated into the deserted city with the help of the U.S. military. One man and his children escaped an attack at a house in the countryside where they were holed up with other survivors – his wife not making it out with them. They are part of the integration program. Things however go horribly wrong as the hope of a cure is turned on its head. What you get here is a compelling movie including both the family drama and horror genres without any problem. Gritty, tense and quite emotional, this is one hell of a sequel. Carlyle is always good and newcomer Imogen Poots playing his daughter (also seen in V For Vendetta) is a beautiful girl and very convincing. Executive producer Danny Boyle also jumped in with some second unit scenes, and made a great choice in director Fresnadillo. 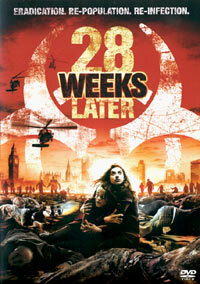 While these are not exactly zombie movies, the original 28 Days Later set the standard to a great extent for the new generation of swift, strong and vicious zombies, as opposed to the slow undead.